As the Islamist “Trojan Horse” scandal picks up speed in the media, governmental agencies and political spokespersons vie with each other to present ever more draconian measures to defend the administration of schools from extremist infiltration. A more pertinent question for us as educators might be how do we arm the minds of the children – for the truth is that the children, not the schools, are the real target. (And remembering, of course, that this arming of the minds must be done without preaching specific versions of faith systems, even that of secularism). As a part of interfaith outreach group for the Muslim community of Norwich, I am in the process of developing a series of RE discovery exercises aimed at primary and secondary schools. I find that structural Cooperative Learning, being firmly grounded in social constructivism, offers a unique tool to teach learners to cope with opposing viewpoints and provides tools to de-construct messages discovering and working outwards from their own understanding. Being told to be critical of certain material presented in the a 60 minute lesson is not the same as teaching critical thinking as a life skill – all the more because critical thinking without a stable vantage point is little more than an exercise in nihilistic futility. I refer to the argument for argument’s sake in a previous post. The key to this vantage point is to help learners reflect – at their individual levels – on issues of epistemology (“How do I know something?”) and ontology (“What is this world that I am in”) in the very practical zone of personal beliefs and experiences in the classroom. Reading the recently published 21C Trivium, which I warmly recommend, I see I am not alone in wanting to re-invigorate logic and rhetoric. Case in point, I recently had a very inspiring experience discussing the categories of necessary, possible and impossible – with a Year 6 class at a village school in Suffolk. A parallel and very practical aim of these exercises is of course to provide the sense of personal integrity and boundaries that will allow the student to engage antagonists inside and outside the classroom in a positive and respectful way and without feeling threatened by the opinions they are presented with. We are not talking about holding one’s ground at all costs – we are talking about the ability to consciously choose when and how much to accept or reject another person’s viewpoints. Note that in the structured debating exercises in pairs and teams afforded by CL, the candid verbalization of otherwise hidden thought processes gives teachers a unique insight into the assumptions and real-time thought processes of each individual student on which to base follow-up (which in turn creates a truly interactive classroom as development of meanings pave a more realistic way than any lesson plan). The “deep thought” is a threatened species, but never as important to foster as it is in these times, when children are subjected to a widening stream of convincing messages through an ever expanding range of media and peers, supplanting and often undermining the coherent narratives that traditionally bound local communities and nations. With no stable narrative, identity – and therefore subjective reality itself – is up for grabs. “Information wants to be free.” No governmental control can stop “radical” or “extremist” ideas from reaching our children – in fact, given what is crawling around in the world wide web, Islamists may be the least of our worries – but we can make sure the Trojan horse is dismantled and burned, if not politely rejected at the door. And should the Greeks have something to offer – well, that that’s at the discretion of a forewarned and fore-armed Trojan Commander-in-Chief. 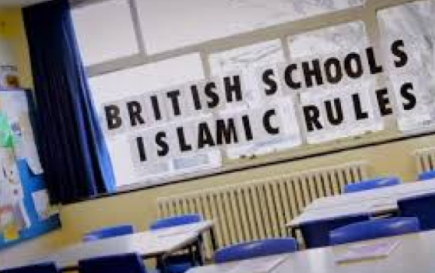 Coming full circle, it just so happens that grammar, rhetoric and logic (mantiq) were an integral part of the traditional Islamic madrassa curriculum; so no radical Muslim cleric can blame UK state schooling for implementing them in the curriculum. One of our presenters at the Healing Fractures workshop, Mr Ibrahim Morrison, will be giving a practical example of how one local Muslim school has been implementing this. More on the RE and P4C on werdelin.co.uk.